The following documents are associated with the upcoming Prom and Post Prom, scheduled for Saturday, April 27 and Sunday, April 28. Please complete review the documents and complete as applicable. Be sure to pay attention to the deadlines associated with each form. individuals not enrolled in high school must be a GCHS graduate and under the age of 21. Form must be completed and submitted for approval by Tuesday, April 23; all guests must be under 21 years of age. Form must be completed and returned by Friday, April 12 in order to secure a free t-shirt. 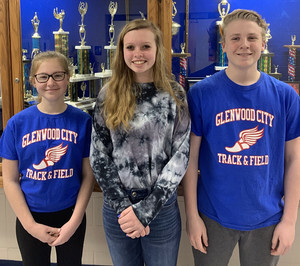 Glenwood City Middle School students Lyra Ketola, Mali Draxler and Nicholas Hierlmeier recently auditioned for the 2019 State Honors Band & Orchestra. The audition was held at Delong Middle School in Eau Claire. The students were required to perform a solo, sight reading etude and several memorized scales. The students will be notified if there were selected in late May. The WSMA Middle Level State Honors Music Project offers talented youth the opportunity to rehearse and perform with nationally-known conductors in a professional setting. All Honors groups perform at the Wisconsin State Music Conference. Middle Level State Honors students receive their music in August and meet for the first time the day before their fall performance. The rehearsal day and formal concert will place in the Madison area. Best of luck to Mali, Lyra and Nicholas on their musical pursuits! Glenwood City High School's Career and Technical Education Department has recently been awarded a number of gifts highlighted by a $20,000 grant from the Donaldson Company Foundation. This foundation strives to provide equitable access to science, technology, engineering and math (STEM) disciplines through grants that increase youth engagement and learning in these areas of study. The grant will be used to help purchase welding machines and other equipment that will help enhance our programming. Thank you to Baldwin Operations Manager of Donaldson, Timothy McCormick and Jordan Hill, Donaldson employee and member of the GCHS Class of 2014 for helping secure these funds on behalf of Mr. Wannemacher and our Technical Education Department. Another grant was provided to the GCHS Agriculture Education Department from the Sand County Foundation in coordination with We Energies, Syngenta, Bayer Crop Science, National Fish and Wildlife and Dairyland Power Cooperative. This grant, in the amount of $1,000 will provide an opportunity to help restore local grasslands to their native state while helping to create an environment for pollinators. This program is designed "... to engage students in adding native wildflower diversity to rural areas for the benefit of pollinators and Monarch butterflies," said Craig Ficenec, Sand County Foundation program director. Congratulations to Mr. Wannemacher and Mr. VanderWaal on securing these funds. The Middle School Staff of Glenwood City Middle School is happy to announce the creation of assignment pages for your middle school student. These pages provide parents an opportunity to be kept up-to-date on what is taking place in their child(ren)'s classrooms in addition to receiving information about tests and/projects as well as upcoming events. By clicking on the corresponding link below, you will be redirected to find your child(ren)'s assignments/activities. If you have questions about specific assignments, please contact the corresponding teacher. The following list denotes opportunities for families and/or students in our area. Please review the links as you feel they relate to you. Each link contains contacts that will allow you access to additional information. You now can access the same daily announcements that grace the start of each school day by simply clicking on the following link. Want to know what's for lunch? Click on the link. Need to know of any club activities or meeting? Click on the link. Wonder if there's a football game at home this week? Click on the link. You may be asked to have permission granted in order to view this document, please click on the tab in order to have access granted pending verification of your email address and affiliation with our students. This safety feature ensures that our students are being protected from online predators. Glenwood City Middle School is proud to acknowledge students who achieve perfect attendance over the course of a month. We understand the connection of being in school to being a successful student and have begun to recognize students who demonstrate perfect attendance each month. Each student who earned perfect attendance is entered into a monthly drawing for a gift card. CONGRATULATIONS to Brooklynn Brite who was the recipient of a $5 Cenex gift card! Below are the recipients of the January's Perfect Attendance Award. There were 70 students who recorded an unblemished record in January. The 2018-2019 Master Schedule provides information about teachers daily schedules - courses taught and hours of prep. Schedule used on in-service dates. Implemented when we experience a 2-hour late start due to poor weather conditions.